Caramelised toast, rich cheese and sweetened apples – our our French Toast recipe with soft white cheese and apple compote satisfies cravings and then some! A breakfast worth waking up to or a dessert too good to pass up, it combines the best of savoury treats and sweet delights. For days in need of something special. 1. Remove the Castello® Double Crème White from the fridge, ideally one hour before serving. 2. Mix the apples with the cane sugar in a saucepan, and heat while stirring over a medium heat until they start to stew. 3. Cook the apples for approx. 15 minutes, or until they are just stewed. Stir the grated ginger into the hot compote and leave to cool. 4. Fry the sliced bread in butter and place to one side. Melt the sugar in the same frying pan and cook until it caramelises, then turn the fried bread in the caramel and allow to cool. 5. 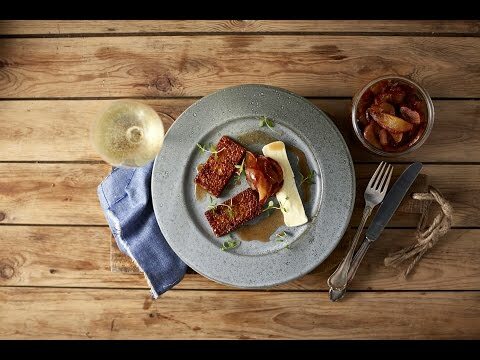 Slice the cheese, and arrange the French toast with the apple conserve, thyme and Castello® Double Crème White. Serve with a chilled Crémant Brut.